Is it too soon to get nostalgic about the aughts? It's only been a couple of years since we made our obligatory end-of-decade lists, but Franz Ferdinand's latest Vancouver show suggested that a resurgence of turn-of-the-millennium styles might not be too far away. The Scottish dance-rock outfit are touring without a new album to promote, and this meant that they were free to focus on back-catalog hits and showcase the finest of their past work. Following a fiery opening set from Atlanta indie rockers Carnivores, the headliners took the stage in front of a large backdrop displaying their band name and opened with "The Dark of the Matinée." This cut from the group's 2004 debut contained all of their best tricks: angular post-punk riffs and slinky verses that gave way to a disco-tinged chorus anchored by a four-on-the-floor beat. Franz Ferdinand repeated this formula several times throughout the night on fan favourites like "No You Girls" and "Do You Want To." These songs didn't offer much in the way of melody, but their brash repetition and pulsing beats meant that they sounded absolutely fantastic, and they inspired fans to bounce along on the Commodore's famously springily floor. Charismatic frontman Alex Kapranos prowled the stage and coaxed the crowd to sing and clap along to these danceable singles. The highlight came mid-set when Franz interpolated Donna Summer's disco classic "I Feel Love" with their own "Can't Stop Feeling" before exploding into their signature tune, "Take Me Out." Unfortunately, the band may have played their best card a little too early, since the rest of the performance lagged in comparison. 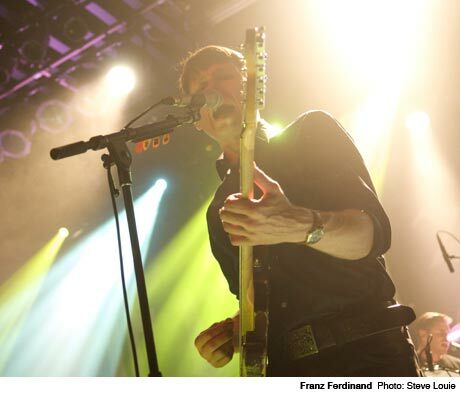 Still, the night gave Franz Ferdinand and their fans plenty to feel good about. After all, regardless of how the band's next album is received, they are guaranteed to find ongoing success once early-2000s revivalism inevitably explodes a few years from now.